I do lots of baking, by the normal person's standards, and especially during this time of year, but virtually all of it is sweet. Cakes, pies, cookies, muffins...these are never unusual in my repertoire, but it takes something like Tuesdays with Dorie to "force" me to bake something savory. I don't know what it is -- I've just always erred on the side of sweet from childhood on. Soy milk sweetened with sugar, or with the addition of green onions, preserved pork, pickled greens, and a drizzle of vinegar and chili oil? Sweet, of course! Brioche french toast with bourbon-pecan topping, or red flannel hash with a poached egg on top? Okay...these days, that decision is a little tougher -- I can't pick a winner. 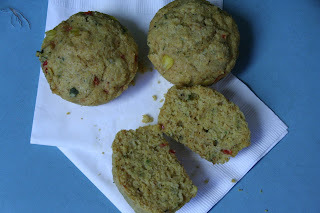 Rebecca of Ezra Pound Cake was the host of this week's recipe, and she picked Savory Corn & Pepper Muffins, thankfully, because I probably never would have made this recipe if someone hadn't. 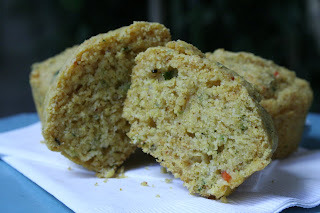 Typically me, I prefer the sweet Yankee style of cornbread (may be because I was first exposed to this kind of cornbread first and most frequently) and the additions of any savory ingredient always perplexed me. Cheese? Jalapenos? Why would you do that?? This recipe came together so quickly despite the chopping of the extra add-ins, and although I feared something went wrong when my perhaps-not-room-temperature-enough buttermilk was mixed with the butter (lumpy, bumpy substance), everything turned out just beautifully. Next time, I think I may even add more black pepper, jalapeno, red pepper, and cilantro, as I felt like those flavors could be more pronounced. I would absolutely serve this at dinner, or as an accompaniment to a yummy hash or egg-based breakfast. I think maybe my salted-sweet-leaning allegiances are now giving way to a finer appreciation for things savory. What is this world coming to? I had this with simple bbq chicken and it was fantastic! They reheat well, too. And of course, slathered with butter.